Weston Peick #34 – 450 class – 5-7 – 6th overall. 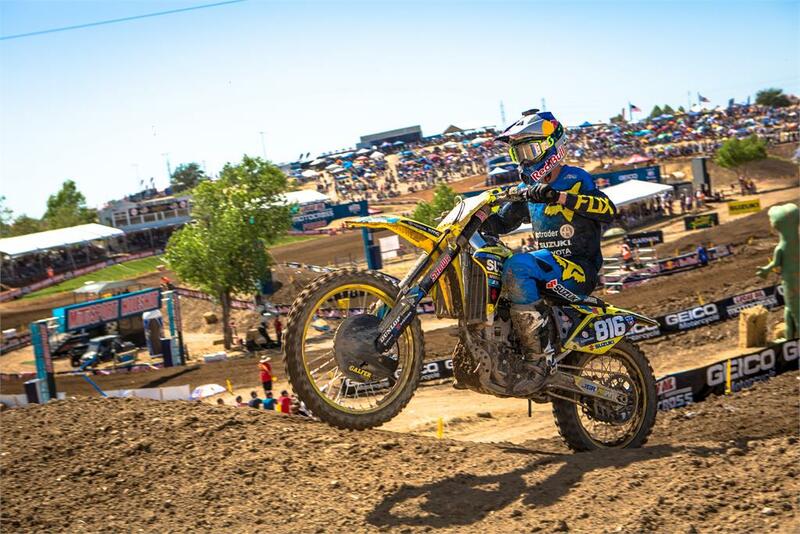 Suzuki RM-Z450 rider Weston Peick finishes sixth in Hangtown opener. Suzuki RM-Z250 mounted Enzo Lopes impresses in rookie debut. Autotrader/ Yoshimura/ Suzuki Factory Racing team entered the opening round of the 2018 Lucas Oil Pro Motocross Championship with high expectations; and the 50th running of the Hangtown National at the weekend served as a reminder that Weston Peick is always ready to do battle, regardless of the conditions. Peick rose to the occasion yet again, finishing sixth overall against a stout field. Suzuki RM-Z450 team-mate Phil Nicoletti rocketed out to the second moto holeshot and finished ninth overall. In the 250 ranks, sensational rookie Enzo Lopes dazzled in his debut, the Brazilian riding well and finishing both motos inside the top 15. Menifee, California native Peick gated well in both motos, starting inside the top 10 and craftily working his way forward. When the first moto concluded, Peick found himself in fifth place – nearly matching his best moto score from 2017. Early in the second moto the RM-Z450 rider was as high as fourth, but a lingering hand issue relegated him to seventh in the moto and sixth overall on the day. Nicoletti had a few short weeks to acclimatise to the all-new Suzuki RM-Z450 after spending the Supercross series on the RM-Z250. Nicoletti looked very comfortable on the RM-Z450, nabbing the second moto holeshot in front of 39 other competitors and leading briefly. The Cochecton, New York rider settled into a consistent pace and finished 9-9 for ninth overall. He will line up on the RM-Z450 again this next week at Glen Helen. News broke several weeks ago that Brazilian amateur star, Lopes, was joining the Autotrader/ Yoshimura/ Suzuki Factory Racing Team for the start of the Nationals. The 18-year-old looked like a seasoned veteran at Hangtown, never giving any quarter and racing hard for the duration of both motos. Lopes’ 13-15 moto scores were good enough for 15th overall. Justin Hill has been tweaking his training regime in an effort to build endurance. The Yoncalla, Oregon rider had bursts of speed at Hangtown and showed promise at various times throughout both motos. Hill finished 16-13 for 16th overall. “There were some highlights for the team coming out of Hangtown. Phil Nicoletti grabbed the holeshot in the second moto and was riding well, but he got landed on, which kept him from having a better result. Still, ninth overall is a good start to the outdoors for him. Peick rode awesome in the first moto, but he began to have troubles with his hand toward the end of the moto. The track was tricky, and Weston soldiered on as best as he could. The Autotrader/ Yoshimura/ Suzuki Factory Racing Team will travel to Glen Helen Raceway in San Bernardino, California on Saturday for the second round of the 2018 Lucas Oil Pro Motocross Championship.